Washington, DC, USA -- Though Buddhism was not native to China, curator Stephen Allee says it wasn’t a hard sell. “It’s a religion of salvation, and so it had great popularity and appeal,” he says. << Known as the transmitter of Chan, or Zen Buddhism, the Chinese monk, Bodhidharma, was said to have a volatile temperament. 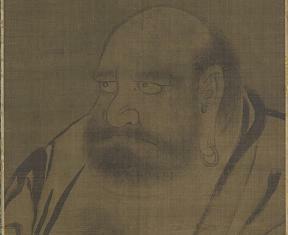 Portrait of Bodhidharma. Fourteenth century, ink on silk. Courtesy the Freer Gallery of Art. As curator of the Freer Gallery‘s new exhibit, “Enlightened Beings: Buddhism in Chinese Painting,” Allee points out that missionaries and traders traveled across the Silk Road in the first century BCE, and over the centuries, they gained a court audience, making Buddhism an integral part of Chinese culture. The exhibit’s 27 works, ranging from the 11th century to the 19th century, tell the story of both Buddhist thought and its adoption in a new land. The lens may seem wide-angle but historical memory holds an important place in a religion that records the transmission of its dogma from person to person. Within a single painting in the exhibit, for example, are representations of 53 generations beginning with Buddha and continuing all the way into the 16th century. 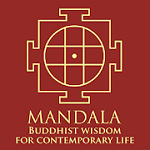 The work is meant to record the unbroken transmission of Buddha’s teachings across time. Allee explains that though China had many native philosophies and religions at the time, few of them dealt with the idea of the afterlife satisfactorily. Thus, the promise of reincarnation, salvation and nirvana appealed to many when Buddhism reached them from northern India. Though salvation was the name of the game, there were other paths practitioners could take. 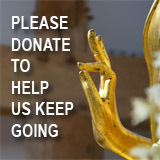 One group, the Bodhisattvas, for example, achieve enlightenment but stay on Earth to aid in the salvation of others. Another, the Luohan, meanwhile, also choose to remain on Earth to protect the teachings of Buddhism. The exhibit also features depictions of lineage masters and Zen monks. Describing Zen, or Chan, monks as eccentric, Allee explains that Zen Buddhism relied on a wordless transmission rather than strict understanding of dogma. “Buddha gave a sermon and one of his followers asked a question,” says Allee. “Instead of answering, he simply held up a flower and the follower instantly achieved enlightenment.” A native product of China in the fifth century, Zen Buddhism became associated with its own style of expressive brushwork. While monks sometimes produced the artworks, patrons could also commission works for temples or for their own homes. Common in both were representations of the four directional gods. Vaisravana, guardian king of the North, served to protect temples and practitioners. He also became associated with wealth, making him all the more popular, says Allee. In one 14th-century ink and color silk painting from China, the artist has included Central Asian dancers and Chinese scholars, thus depicting the religion’s broad geographic and historical reach. “Enlightened Beings: Buddhism in Chinese Painting” opens September 1 and runs through February 24, 2013.